As of today we have had 941 visitors walk through the doors of PRESS! Our new exhibit, The EXCHANGE, opened last Thursday the 28th and will be up until August 25th. So who wants to come see the new prints and help us reach 1,000 visitors through the doors of 105 Main Street?! With no signs of stopping, Melanie has been pumping out new prints on the Vandercook almost everyday. 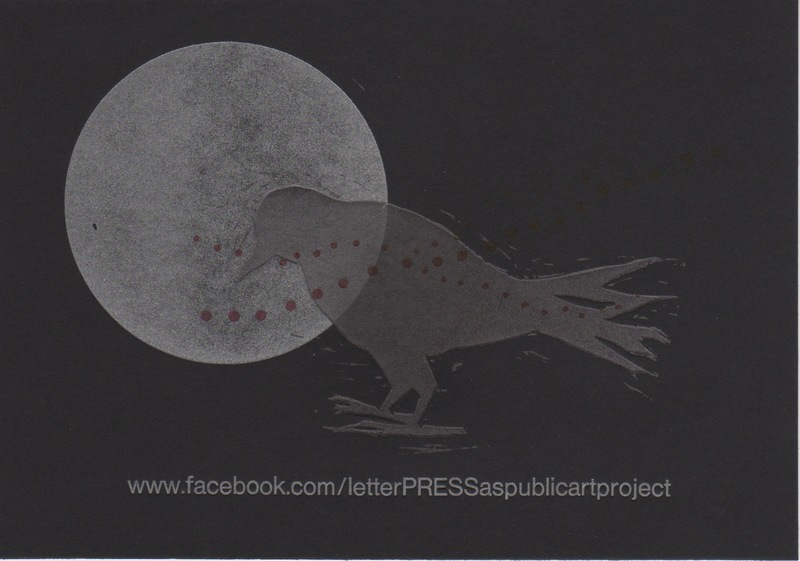 Whether it’s a new series, a linoleum block print, low relief pressure print, greeting cards, or our new post cards there is a lot of new things happening at PRESS. Be looking for some open workshops at PRESS during the month of August as we continue to our cause of sharing the art of printmaking with the public. PRESS now also has a Limited Edition postcard! How can one acquire a Limited Edition PRESS postcard made on our Vandercook Universal III by Melanie herself? It’s easy! Just bring in your old t-shirts that you are thinking of throwing out or any NO-LINT rags and you will walk away with one of our Full Moon Limited Edition postcards. The reason for this is that we prefer to use rags with no lint or strings that separate from the rag to clean the Vandercook’s ink rollers.